In New York, live music clubs are among the places you should not miss. This author made it to “CBGB,” one of the oldest clubs with live rock of all the New York clubs. 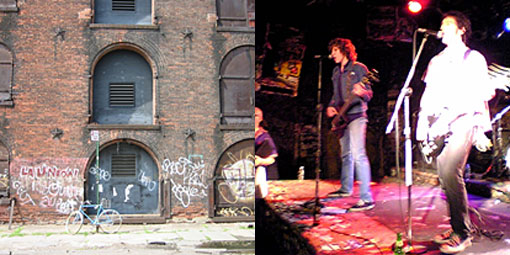 Back in the 1970s, in the heyday of NY punk, the Ramones, Television, Patti Smith, and other punk legends performed at CBGB, turning the club itself into a legend. I heard it was shutting down soon, so I decided to find some time to visit it, although I was on a business trip then. I got my work done, and was free at long last, but it was already 11:00 pm in the evening. I was already behind schedule. No time to lose. I dashed out of my hotel into a subway train, and walked out of my destination station, with a handwritten map to the legendary club drawn on a memo sheet in my hand. Some walk from the station took me to CBGB’s signboard, which was familiar to me. A bit nervous, I entered the legendary spot. The sleazy bar counter, the walls with many layers of band fliers, and – everything suggested what kind of place this was. On the stage, unexpectedly small, however, I saw a chubby, unattractive vocalist singing, to my slight disappointment. Well, I changed my mind and listened to the songs until the end, because “the rock’n’ roll magic happens when a low-res turns into a superstar on the stage.” Still, none of the songs moved me. The clock was close to 1:00 am. Yet I did not want to leave the legendary place dissatisfied and go straight back to my hotel. I decided the next band would give me a great night in a great place. The band, three-piece, featuring edgy guitar and powerful, hurtling rhythms, made a fair performance. Still, I did not find that “something special” I expected from a legendary NY club in this band, either. Well, after all, just being able to visit this epic club gave me some satisfaction. I got out of it, and found a store next-door, which carried things like T-shirts with a musician’s logo. I stepped inside, into darkness – the store was already closed for the day. Yet I found a tiny stage deep inside. With only several people in the audience, the place seemed deserted. Still, in the ghostly spotlight, a musician was singing and playing an instrument, alone. Lou Reed’s “Walk on the Wild Side” was the song. The singer repeated “Walk on the wild side”, and his voice truly carried the message across to me. Something hot gradually emerged from within my heart. This phrase, “Walk on the wild side,” is very appropriate for the city of New York and its people. Then I found myself, who had dreamed of the city for so long, deeply satisfied with being right there in the middle of it. 315 Bowery, New York, NY, U.S.A.